The mountains rumble under the thundering hoofbeats of 40,000 barbaric horsemen. When the player characters find themselves in their path they have no choice except to flee. Their journey takes them into the forbidden Kingdom of Ra-Khati, a land of ancient mysteries and untold wealth nestled deep within the Katakoro Mountains. As honored guests they are invited to partake of its extravagance. Wealth, power, romance - anything can be theirs for the asking. That is, anything short of their freedom! But when invaders threaten the Hidden Kingdom, the PC's are given a chance to earn their liberty. They are charged with escorting a spoiled princess and her dowry, a ferocious black stallion, to a nearby kingdom as a bribe to stop a war. Nothing stands in their way except 40,000 bloodthirsty riders and a vengeful purple dragon. 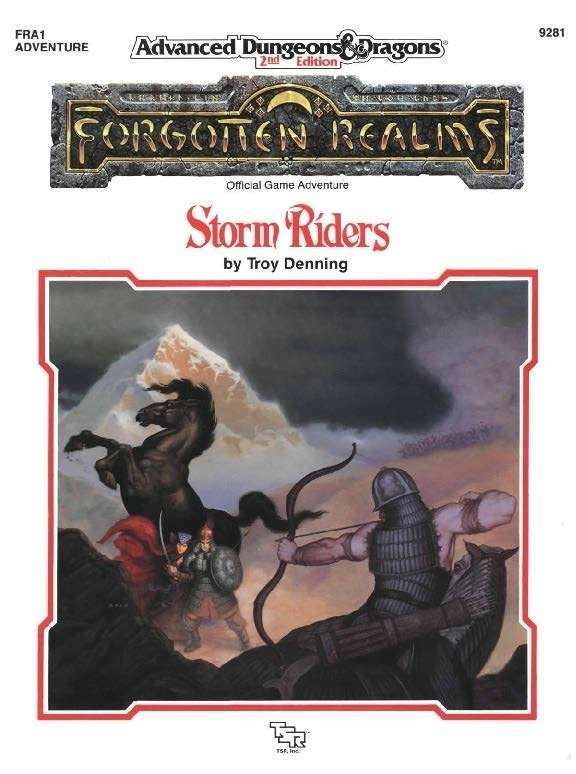 FRA1: "Storm Riders" (1990), by Troy Denning, was the lead adventure in TSR's second "Realms-shaking" event: Empires. It was released in April 1990. Event Origins. Due to the success of the Avatar event (1989), TSR opted to create a follow-up for 1990 that would similarly by supported by adventures and novels. 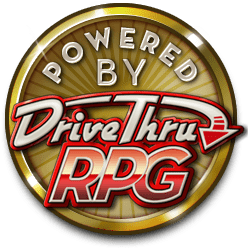 TSR didn't try to out-cosmic Avatar's divine shake-up, but they still wanted to create an important event. Eventually they decided to introduce the Hordelands, a brand-new land to the east of the Realms proper, connecting it to Kara-Tur: The Eastern Realms (1988). The denizens of the Hordelands would be engaging in a massive war against the nearby lands, which gave the event its name: Empires. In creating the Empires event, TSR wanted to correct some of the problems of the Avatar event. In particular, the Avatar project had been plagued by coordination problems due to the use of a large set of creators spread across North America, the requirements of a short schedule, and the creation of novels and adventures that closely mirrored each other. In contrast, the Empires event got a year of lead time and was mainly produced by three people. James Lowder (who had also been the project lead for Avatar) oversaw the project; David "Zeb" Cook designed the main sourcebook; Troy Denning wrote the adventures; and each of these creators wrote one of the three novels. The fact that all three creators were local to TSR's Wisconsin offices made it even easier to keep everyone on the same page. Empires was also much more creator-driven than Avatar had been: each creator got to pitch his own ideas for his products, rather than being handed down directives from on-high. This resulted in a story with more breadth than the very tightly-constrained Avatar: each novel looked at the Horde attacks on civilized lands from a different point of view, while the adventures told a related (but interconnected) story that kept players from needing to follow in the footsteps of the novels' leads. The result wasn't as financially successful as Avatar — which isn't surprising, as it was historical fantasy rather than cosmic fantasy. However, it was one of the more innovative and creative Realms-shaking events — and definitely one of the events shook the Realms the most. Introducing the Horde. The Horde was a Mongol-like army led by a charismatic leader who was determined to attack both Kara-Tur and the west. Its existence was first hinted at by James M. Word in "The Game Wizards" from Dragon #152 (December 1989), where he said: "The Horde is going to hit the Forgotten Realms, and boy, is somebody going to be sore!" The Horde was actually TSR's second looked at a Mongol-like society in just a year, the previous one being GAZ12: "The Golden Khan of Ethengar" (1989) for Basic D&D's Known World. Introducing the "FRA" Adventures. The Empires plotline is actually somewhat peripheral to "Storm Riders", which instead focuses on the Tibet-like country of Ra-Khati and its conflict with the nearby country of Solon. Nonetheless, it's the movement of the Horde toward eastern lands that enables the conflict, and the Horde's story continues to intersect with the adventure's plotline over the course of the module. By setting up the Horde as part of the background underlying "Storm Riders", the adventures is clearly tied to the Empires novels without being entirely beholden to them. This would be the general model followed by the entire trilogy of "FRA" adventures, which continued with FRA2: "Black Courser" (1990). The Novel Connection. April also saw the release of the first in the Empires trilogy of novels: Horselords (1990), by David "Zeb" Cook. It focuses on the viewpoint of the Horde itself, as Yamun Khahan unites the tribes of the Hordelands and turns toward Kara-Tur. It's this advance that the player characters (and Ra-Khati) are caught up in during the "Storm Riders" adventure. Expanding Oriental Adventures. Somewhat surprisingly, the entire Empires event closely ties in to the AD&D 1e book, Oriental Adventures (1985). Though the book was never updated to 2e, its use is recommended in "Storm Riders" — showing how close the two editions were, and how little players and designers were concerned about the edition change at the time. These ties comes in part from the use of the book's setting of Kara-Tur, which had been linked into the Realms through Kara-Tur: The Eastern Realms. However, there had always been one problem with the setting: Kara-Tur was huge according to David Cook's original design, and that hugeness became very apparent when the Hordelands connected the setting to the western Realms. This issue would be resolved a few months later in The Horde Barbarian Campaign Setting (1990), which explicitly reduced the scale of all of the Kara-Tur maps by one-third. Expanding the Realms. "Storm Riders" marked the beginning of the largest expansion of the Realms since the release of Kara-Tur: The Eastern Realms. Full details would have to await The Horde Barbarian Campaign Setting, but "Storm Riders" includes extensive details on the Hordelands country of Ra-Khati and the city of Kushk. About the Creators. Denning and Lowder were both veterans of the Avatar event from the previous year, while Cook was the master of the Realms' eastern lands. They were thus a perfect trio to produce the Empires event. Missing poster map as of July 16, 2014. This title was added to our catalog on February 11, 2014.